Throughout yesterday messages were sent out from within the Egyptian regime to the effect that Husni Mubarak was about to resign. Millions went onto the night streets to celebrate the victory. Then, incredibly, Mubarak repeated his intention to stay. He lied about his contributions to Egyptian sovereignty and addressed the Egyptians as his children, to screams of derision. Despicable as he is, there was something of the tragic hero about him, tragic in the Greek or Shakespearean sense. The very traits which had thrust him to greatness – stubborness, brutishness, contempt for the people – were condemning him, with every word, to the most ignominious humiliation. He spoke from the gravel of his octogenarian throat, a man of the past adrift in a strange new world. Tragic or not, it was certainly theatre – directed by the military. Communique Number One had already been delivered. Then this evening Omar Suleiman made a curt admission of defeat, for he too has been deposed (although he announced only Mubarak’s fall). The military’s Supreme Council is in charge. Communique Number Three was delivered shortly after Suleiman’s statement. The army spokesman appreciated both Husni Mubarak’s service and the sacrifices of the revolution’s martyrs. For the latter he gave a slow miltary salute. He said the army was not an “alternative to the legitimacy that is acceptable to the people,” and that further communiques would lay out the reform process. Victory provoked a wave of celebration amongst the millions in Cairo, Alexandria, Mansoura, Mahalla, Suez, chants and tears and whoops of joy stretching out across the Arab world. Beirut, Gaza, Ramallah, Amman are demonstrating in support of the revolution. Syrian state TV is broadcasting al-Jazeera’s live feed. Is all this premature? There is very good reason for optimism. In the last three days revolutionary momentum has carried Egypt beyond the point of no return. Workers – in textiles and munitions factories, in communications and transport, in the electricity and gas sectors, from all the ministries – have not merely gone on strike: they’ve demanded the sacking and trial of their company directors. When the police in the Kharga Oasis or in Sinai or Upper Egypt have attacked the people, the people have burnt police stations. Once people’s dignity has been restored, nothing will silence them except justice. What is happening now will boost the hopes of strugglers everywhere, not least throughout the Muslim world. But it has a special consequence for Arabs. For all their diversity, the Arabs are in many respects one people, linked by language, history and culture. Today they are more linked than ever, by their news station al-Jazeera, by Lebanese and Egyptian pop music, Egyptian comedy, Syrian period dramas, by the same tele-evangelists and TV presenters, by itinerant labour and the common police-state heritage. And by the same political passions. The idea of Arabism was abused and grievously wounded by the ascent of police states which stoked petty nationalisms, retreated from pan-Arab causes (primarily Palestine), and promoted backward, mythical thinking. Arabism was stale state rhetoric, its official heroes the warlords of past and present. The people seemed to play no role, except in the quasi-fascistic evoking of their ‘blood’, their ‘eternal message’. Too many people stopped believing in themselves. But Arab Tunis rose up. Inspired by Tunis, mighty Egypt rose. Today American control over the Arab region is collapsing. Palestine faces a different future to the one it faced yesterday. The Arab nation is back. 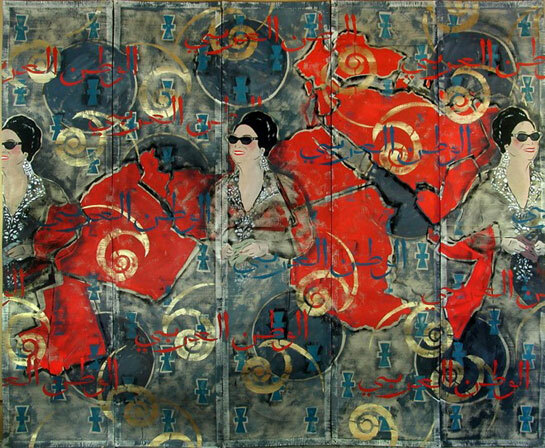 The picture is ‘al-Watan al-Arabi’ by Egyptian artist Chant Avedissian. Your last paragraph is just: WOW! Great piece. Yes, the Arab nation is back, and that changes everything for Palestine and every country min almo7eet ila al5aleej. Very thought provoking piece. I’m not sure whether I’d agree that the Arab nation is back though. Although, the Arab world’s dignity has definitely returned spectacularly. The real revolution in Egypt and across the Arab world that is needed is not one that only topples regimes and trynats, it is a systemic revolution. Although Mubarak and a lot of the regime’s infastructure is gone, a systemic change is needed to provide a lasting improvement in the lives of Arabs across the Middle East. Although not the only answer, the biggest question I think that needs to be answered to acheive this change is, what role will Islam play in the governments of the future? This question has never been answered in any Muslim country in a satisfactory way since the fall of the Ottoman empire (or arguably even earlier). Turkey has tried and failed miserably to answer this question as have countries like Saudi and Iran. I think that was one of the main reasons why Pan-Arabist ideology failed to really win over the hearts and minds of the Arab street. It could never really provide a comprehenisve set of ideas that would appeal to a predominantly Muslim population.